[S340] Census - 7 Apr 1861, UK census, ED 4 RG9-3124 Folio 62 p14 GSU roll 543082. [S190] Index - GRO and Office of National Statistics, England & Wales Civil Registration Qtrly Indexes, Marriage: District of Liverpool, Vol 8b, p501, 3Q1855. [S367] Census - 2 Apr 1871, UK census, ED 9 RG 10-3852 Folio 48 p11 GSU roll 841930. [S190] Index - GRO and Office of National Statistics, England & Wales Civil Registration Qtrly Indexes, Death: District of West Derby, Vol 8b, p376, 1Q1877, aged 44. [S1119] Toxteth Park Cemetery, Liverpool, Inscriptions, at http://www.toxtethparkcemeteryinscriptions.co.uk/, stone at Section A, grave 211. [S1120] Toxteth Park Cemetery, Liverpool, at http://www.toxtethparkcemetery.co.uk/dbase/toxsearch.htm, Folio 716, entry 14310, Section A, grave 211, class 352 CEM 9/2/2. [S190] Index - GRO and Office of National Statistics, England & Wales Civil Registration Qtrly Indexes, Birth: District of Preston, Vol 8e, p388, 1Q1859, mother's maiden name SPENCER. [S954] Website - Anglican Parish Registers, at http://www.ancestry.com/, Liverpool, England, Church of England Baptisms, 1813-1906, Liverpool Record Office, Ref 283 PET/2/57. [S190] Index - GRO and Office of National Statistics, England & Wales Civil Registration Qtrly Indexes, Birth: District of Liverpool, Vol 8b, p206, 1Q1865, mother's maiden name SPENCER. [S190] Index - GRO and Office of National Statistics, England & Wales Civil Registration Qtrly Indexes, Birth: District of Liverpool, Vol 8b, p137, 2Q1872, mother's maiden name SPENCER. [S190] Index - GRO and Office of National Statistics, England & Wales Civil Registration Qtrly Indexes, Death: District of West Derby, Vol 8b, p469, 3Q1874, aged 0. [S443] CD - NZ Marriages, CD - NZ Marriages 1836-1956 V2, NZ Registrar General's Folio 431. [S542] Index - New Zealand BDMs online, at http://www.bdmhistoricalrecords.dia.govt.nz/, Marriage Reg. No. 1883/699. [S911] Newspaper - Christchurch Press, issue of 29 Mar 1883, issue 5468, Vol XXXIX, p2, Marriages. [S875] Census - 6 Apr 1891, Canada census, Victoria City James Bay Ward, Victoria, British Columbia, Roll T-6291, Family 107. [S443] CD - NZ Marriages, CD - NZ Marriages 1836-1956 V2, NZ Registrar General's Folio 5014. [S542] Index - New Zealand BDMs online, at http://www.bdmhistoricalrecords.dia.govt.nz/, Marriage Reg. No. 1912/5750. [S908] Newspaper - Nelson Evening Mail, issue of 23 Jan 1912, Vol XLVII, p2, col 4, Wedding. [S542] Index - New Zealand BDMs online, at http://www.bdmhistoricalrecords.dia.govt.nz/, Death Reg. No. 1920/9039. [S908] Newspaper - Nelson Evening Mail, issue of 14 Feb 1920, Vol LIV, p5, Obituary. [S970] Nelson City Council cemetery database, at http://nelson.govt.nz/services/facilities/cemeteries/…, Wakapuaka Cemetery, ID WKNP07052, block 7, plot 52, Presbyterian, aged 61. [S1107] Index - Canadian BDMs, at www.ancestry.com, British Columbia Vital Statistics Agency, Death Reg. No. 1890-09-006034, BCA No. B13077, GSU No. 1927287, aged 0. William Theodore HAMPSON was born in Victoria, British Columbia, on 15 October 1892. [S418] Ancestry.com - misc sources, at http://www.ancestry.com/, New Zealand, School Registers and Lists, 1850-1967, Nelson College. [S569] Waikumete Cemetery database, at http://www.waitakere.govt.nz/cnlser/cm/cemeterysearch/…, Waikumete Cemetery cremation record. [S542] Index - New Zealand BDMs online, at http://www.bdmhistoricalrecords.dia.govt.nz/, Death Reg. No. 1951/26243, aged 62. [S1158] Book - unknown author UK & Ireland Medical Directories 1845-1942. [S1159] Website - Liverpool Records Office, at http://www.ancestry.com/, Liverpool Crew Lists 1861-1919, ref 387CRE/692 for Priam, #63243. [S568] Purewa Cemetery & Crematorium database, at http://www.purewa.co.nz/, serial #737, block B, row 3, plot 10. [S542] Index - New Zealand BDMs online, at http://www.bdmhistoricalrecords.dia.govt.nz/, Birth Reg. No. 1917/2234 in the name of Denis Kempthorne; Death Reg. No. 2002/19827 gives this birthdate for Michael Kempthorne. [S863] Newspaper - New Zealand Herald, issue of 28 Mar 1917, Vol LIV, issue 16500, p1, col1, Births. [S443] CD - NZ Marriages, CD - NZ Marriages 1836-1956 V2, NZ Registrar General's Folio 9654. [S542] Index - New Zealand BDMs online, at http://www.bdmhistoricalrecords.dia.govt.nz/, Death Reg. No. 2002/19827. [S542] Index - New Zealand BDMs online, at http://www.bdmhistoricalrecords.dia.govt.nz/, Birth Reg. No. 1886/18900, and Death Reg. No. 1973/32376 gives this birthdate. [S443] CD - NZ Marriages, CD - NZ Marriages 1836-1956 V2, NZ Registrar General's Folio 132. [S542] Index - New Zealand BDMs online, at http://www.bdmhistoricalrecords.dia.govt.nz/, Marriage Reg. No. 1920/2867. [S801] Newspaper - Auckland Star, issue of 12 Feb 1920, Vol LI, issue #37, p12, col1, Marriages. [S542] Index - New Zealand BDMs online, at http://www.bdmhistoricalrecords.dia.govt.nz/, Death Reg. No. 1955/22502, aged 72. [S542] Index - New Zealand BDMs online, at http://www.bdmhistoricalrecords.dia.govt.nz/, Death Reg. No. 1973/32376. [S542] Index - New Zealand BDMs online, at http://www.bdmhistoricalrecords.dia.govt.nz/, Birth Reg. No. 1884/10589. [S703] Newspaper - Southland Times, issue of 12 Feb 1884, issue 4861, p2, col3, Birth. [S863] Newspaper - New Zealand Herald, issue of 21 Jul 2016, Death Notices. [S542] Index - New Zealand BDMs online, at http://www.bdmhistoricalrecords.dia.govt.nz/, Death Reg. No. 1975/50117 gives this birthdate, but appears to be a year out. [S801] Newspaper - Auckland Star, issue of 27 Dec 1919, Vol L, issue 306, p12, col1, Births. [S443] CD - NZ Marriages, CD - NZ Marriages 1836-1956 V2, NZ Registrar General's Folio 6083. [S542] Index - New Zealand BDMs online, at http://www.bdmhistoricalrecords.dia.govt.nz/, Death Reg. No. 1975/50117. [S542] Index - New Zealand BDMs online, at http://www.bdmhistoricalrecords.dia.govt.nz/, Birth Reg. No. 1880/16622. [S703] Newspaper - Southland Times, issue of 27 Oct 1880, issue 3854, p2, col3, Births. [S542] Index - New Zealand BDMs online, at http://www.bdmhistoricalrecords.dia.govt.nz/, Death Reg. No. 1880/4136, aged 20 days. 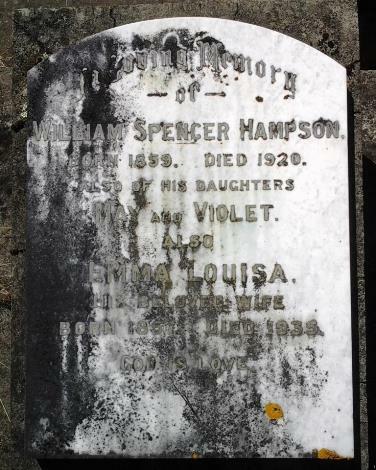 [S586] Invercargill City Cemetery database, at http://www.icc.govt.nz/ServicesA-Z/Cemeteries/…, Eastern Cemetery, General block, plot 9/14, infant, no headstone.